Probably the best way of starting to learn how to play bridge is to find a local class – often these are run by local Adult Education Centres or Colleges or take place in village or community halls. If there is a beginner’s bridge class in your area I would strongly suggest that you join it if you can. You will meed other people who are also starting to learn and the atmosphere should be relaxed and friendly. Not everyone can join a class, though. There might not be a class near you. You might not be able to attend a class because of work, family or other commitments (have you noticed how everything you want to join seems to happen on the same night?) or you might find getting to a class difficult for health reasons. Whatever your situation, there is another way to learn. You can learn to play bridge online. You need to be able to cope with the basics of using a computer – and be able to control the mouse, but it isn’t necessary to be a total computer whizz to benefit. If you live in the UK, Ireland or New Zealand you will probably want to learn to play Acol bridge. 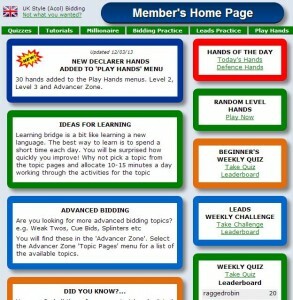 No fear bridge UK is the best play for learning online. Anyone can use the site – from complete beginners to improvers and beyond. If you can’t get to a beginners’ class, you will find everything you need to learn to play bridge is on the site. There are tutorials for complete beginners, quizzes, hands to play, bidding practice, leads practice, hands of the day, progress charts, flash cards, daily tips and more, with new material being added regularly. If you are attending a class, joining this site will help you get the most out of the class by giving you extra material to work on between lessons and allowing you to play bridge online from the comfort of your own home. If you can’t get to a class, or just want to learn online at your own pace, then this is the site for you. There is everything you need to take you from complete beginner to competent player. Many of the practice hands have audio feedback for incorrect play to help you understand where you went wrong and explain which card you should have played. You can learn at your own pace and repeat each exercise and tutorial as often as you want. Computers don’t get bored, or cross if you learn slowly. Your computer will happily let you go through each tutorial or practice hand or flash card as many times as you feel you want to. It won’t mind if you do the same tutorial every day! This is a great resource if you feel a bit left behind in your classes or feel that you would like your tutor to cover topics again. If you want to start to learning, then you will quickly see the benefits learning to play bridge online if you click here to join No Fear Bridge UK. There is a two week, no obligation, trial. Most of the world plays one or more variations of American Standard bridge. It is the system used by most of the online bridge playing websites. If you want to learn to play bridge online and play the game on one of the online bridge sites then you will want to learn to play American Standard bridge. No Fear Bridge US is the place for you. It follows the same format as the UK site but teaches you Standard American bidding and play. Click here to join the American Standard bidding site. There is a two week, no obligation, trial. I found your blog yesterday. I was looking for a way to learn to play bridge online and you’ve shown me where I can go to do that. Thank you.